Clifton Park on the edge of Rotherham town centre has been recognised, for the eighth year running, by the Green Flag Award Scheme as one of the very best in the world. In the scheme's 22nd year, a record-breaking 1,883 Green Flags have been awarded to green spaces large and small across the UK. They are a sign to the public that the space boasts the highest possible environmental standards, is beautifully maintained and has excellent visitor facilities. 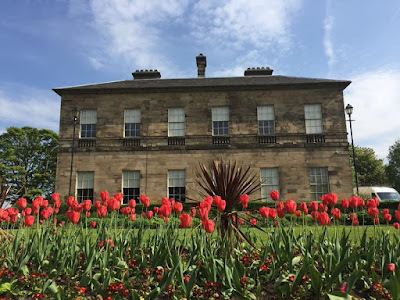 This year, for the first time, Clifton Park has also received the much coveted additional Green Heritage Site Accreditation for the management of the historic features. Between 1783 and 1784, Joshua Walker, of the Walker Iron & Steel Works of Masborough, and local architect John Carr, built Clifton House which included stables, outbuildings, dovecotes, fishponds, an icehouse, and wells. Clifton Park was originally laid out as the private grounds of the house, which is now Clifton Park Museum. When the estate was put up for sale for building plots, Rotherham Council recognised the need for green space in the expanding town and bought 54 acres (22.5ha) for £25,000 in 1891. £5,000 was spent on improvements and the park was opened to the public by the Prince and Princess of Wales on the June 25 1891. Investment in recent years includes £7.5m in 2009 to bring the walled garden back into use and updating the paddling pool with an innovative splash park. In addition, a play park was designed in consultation with young people with eight separate areas including a skate plaza, sand area, chill out area and an enchanted wood. Cllr. Sarah Allen, cabinet member for Cleaner, Greener Communities at Rotherham Council, said: "We are really delighted to receive a Green Flag Award for the eighth time and also win the Green Heritage Accreditation. We know how much quality green spaces matter to residents and visitors, and this award celebrates the dedication that goes into maintaining Clifton Park to such a high standard. "Clifton Park is very popular with families from across the county and they can enjoy a fantastic day out. The award is a tribute to all those working hard to keep everything looking beautiful for its visitors and to all of the visitors who take care of the park when they use it." In August it will be the public's turn to vote for their favourite Green Flag park in the Green Flag People's Choice Awards. Clifton Park won this award in 2016 and 2017 and is now officially recognised as one of Britain's 10 favourite parks. Staff at Clifton Park are hoping that with the help and votes of all of those who love the park, the People's Choice Award can be repeated at Clifton Park in 2018. We take Clifton Park for granted but its well worth these awards.